Most common CatOnium PTC’s are quaternary ammonium salts containing either alkyl or mixed alkyl/aryl groups. Their applicability is restricted by the thermal stability which is limited to about 100°C. 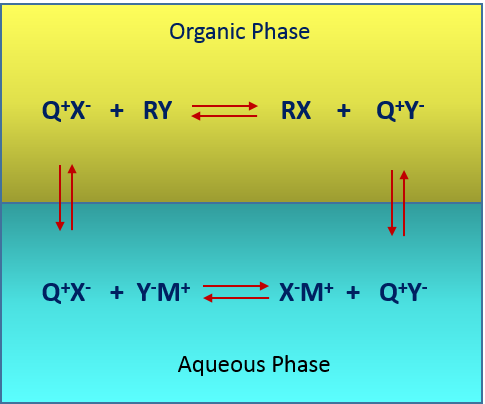 CatOnium phase transfer catalysts comprises broad range of quaternary ammonium halides, with F–,Cl–,Br– and I– as counter anions, and limited number of quaternary hydroxyl ammonium compounds, with an OH– group as counter anion. Phosphonium PTC’s are used in the cases in which the use of ammonium compounds is not suitable because of their thermal instability. The thermal stability of CatOnium quaternary phosphonium salts is quite good in a range between 120-150°C, with indications that they can be also used at temperatures up to 200 °C.